The Hebden Level spoil heap is locally known as Smithy Hill, because the northern section was once leased to William Bell, the local blacksmith, and had an impressive stone smithy built on it. This was probably in the late 1880s, as the 1890 25" OS map has the smithy marked. 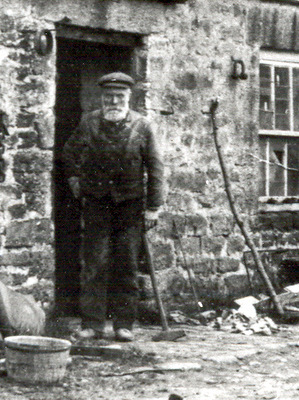 The son of a blacksmith, William Bell was born in Aireton in 1849. He married Mary Warden, from Lancaster in 1877, and was settled in Hebden by 1878 where he lived until his death in 1931. He had seven children. In 1901 his 13-year old son William was recorded as being a "blacksmith's help". William Bell must have been a remarkable craftsman, as he made Hebden Suspension Bridge which crosses the River Wharfe adjacent to the stepping stones. It was erected in 1885, and paid for by public subscription. Made of recycled materials from the local lead mining industry, including 262 yards of steel cable, it originally had a central supporting pier (the base of which can be seen in low water conditions) which was removed when the span was raised in 1937 after being damaged in a heavy flood. The following photographs are available on other pages. 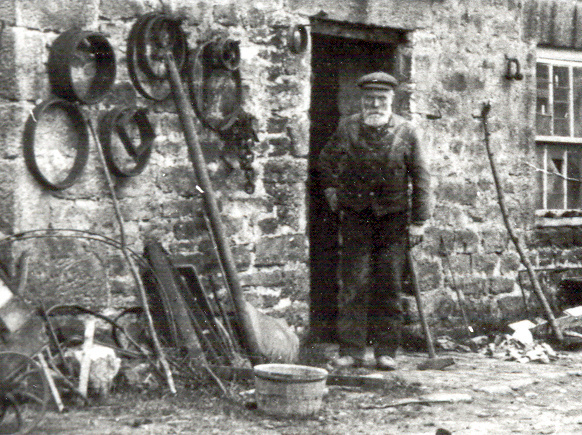 Photograph of William Bell and the smithy on Smithy Hill taken in the 1900s. Photograph of Smithy Hill with the smithy and the waterwheel taken about 1900. Photograph of Extract of the 1890 25" OS map showing the position of the smithy. Photograph of Hebden Suspension Bridge taken in the 1900s showing the central support.